Thank you for your response. I tried using that version (the link you posted), also, and transparency does not work there either; I have been a client of Arbor domains for many years and prefer to use that IM site because the with the link you posted there are tons of "foreign" cookies invading my privacy. Arbor has always been reliable and I have never had ANY real problems with them and have used that version of IM for many years, also, even through there are frequent problems. If need be, and if tech support is included, I might be interested in purchasing my own IM site. Please provide more information about your exact steps (so some one can try to reproduce your problem) and whether your glitter image is an animation or a single frame image and what image format. Looks like a bug to me. Perhaps it is running IM 7 which has the alpha reversed. I will forward to the IM developer. Look for a fix to this problem later today. Thanks. You are my hero!! Many thanks! I tried the "fix" (2:45 pm edt) and it isn't fixed. Also, I have been trying to use the "draw" function, loading an image, then trying to work with "ellipse"; however, the image does not appear on the "draw" page to be manipulated. I have used three different versions and am beginning to wonder if Image magick is no longer functioning for public use these days. It is very frustrating and I wish they would just make this fact known. I have been a client of Arbor Domains, as mentioned, and am more than willing to PAY actual money for the ability to use this service which has functioned properly in the past. Unfortunately, a couple of years ago it became so troublesome I stopped using it all together. If it is NOT available for use by the public, it should be removed from Arbor Hosting or be adjusted to function properly, instead of being offered as a free service. At least we would know where we stand. IM reminds me of my one and only ex-husband --- dysfunctional and beyond help! gollywobbers wrote: I tried the "fix" (2:45 pm edt) and it isn't fixed. Also, I have been trying to use the "draw" function, loading an image, then trying to work with "ellipse"; however, the image does not appear on the "draw" page to be manipulated. I have used three different versions and am beginning to wonder if Image magick is no longer functioning for public use these days. It is very frustrating and I wish they would just make this fact known. I have been a client of Arbor Domains, as mentioned, and am more than willing to PAY actual money for the ability to use this service which has functioned properly in the past. Unfortunately, a couple of years ago it became so troublesome I stopped using it all together. If it is NOT available for use by the public, it should be removed from Arbor Hosting or be adjusted to function properly, instead of being offered as a free service. At least we would know where we stand. IM reminds me of my one and only ex-husband --- dysfunctional and beyond help! Magick did not say when it would be available. Perhaps he has not fixed it yet. It might not be done until later this evening his time. Also it would not go over to Arbor unless they get it from the Magick Studio official site, which could take days or weeks until they update. You need to contact them to upgrade or deal with any issues on their side. The only changes that will show immediately will be on the official web site, once the fix is made. The Imagemagick developers have no control on any other source of this tool. gollywobbers wrote: Also, I have been trying to use the "draw" function, loading an image, then trying to work with "ellipse"; however, the image does not appear on the "draw" page to be manipulated. There seems to be a problem with the draw ellipse, at least for me. It works, but one needs to use correct coordinates and not the default values. However, the image does not show on the draw page until after you select your coordinates and push the draw button. Then you see the selected image and the ellipse over it. I do not know if it ever showed on the draw page before selecting coordinates and pushing the draw button. That may just be the way it is. Note the Translate to the center of the image at 128,128. Then the coordinates are 0,0 (for the translated center), 50,25 for the xradius, yradius, and 0,360 for the full around ellipse. 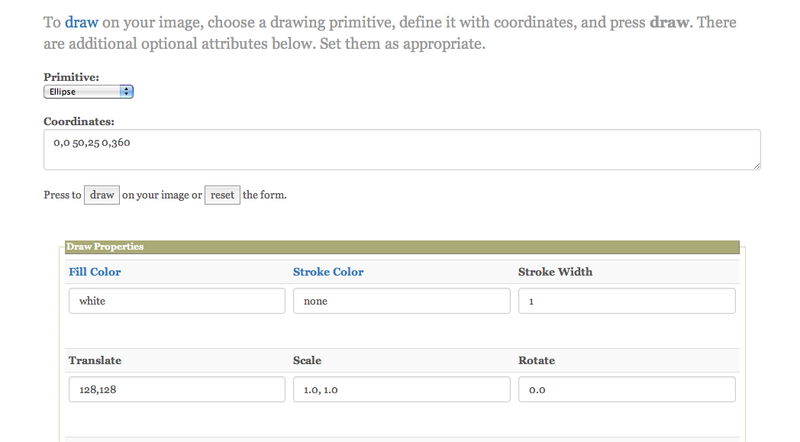 > However, the image does not show on the draw page until after you select your coordinates and push the draw button. The MagickStudio web site @ http://www.imagemagick.org/MagickStudio is not responsive-- you do need to push the Draw button before an eclipse is drawn. 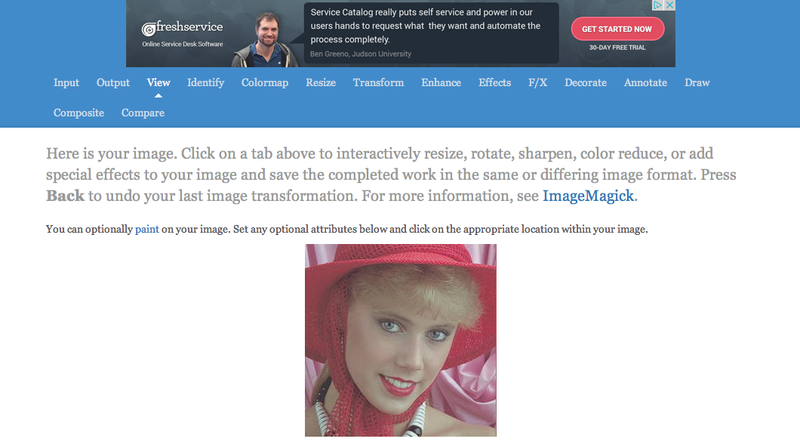 We do have a more modern web interface to ImageMagick @ http://jqmagick.imagemagick.org/. Arbor has no control over the ImageMagick product MagickStudio. They are not the developers. The responses from "magick" are right from the MagickStudio developer. I have passed these issues to him directly as a courtesy to you so that he is aware of them as quickly as possible. And he has answered them in as timely a manner as he can. My responses here were to try to help you, though I do not know the MagickStudio product very well and to confirm any bugs you might have encountered and report my confirmations to magick. I have just checked and the transparent issue seems to be fixed for me on the official MagickStudio web site. We are sorry to see you leave.